The LAN Connect Controller adds Ethernet functionality to any CNC machine tool with serial capability. Send programs files from a LAN server to CNCs through the regular and Remote models. Drip-feed (DNC) large files from the data server that do not fit in the memory of the CNC. Control and manage which files are available to operators on the shop floor from CNC programming stations or Engineering department. Works with Microsoft’s Windows Explorer. Because setup is easy, connect to virtually any CNC control on the market. This device will help you add Ethernet to your CNC. 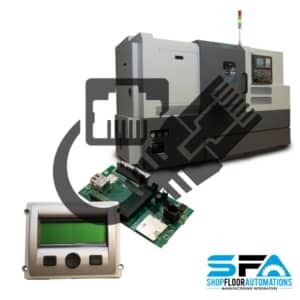 Your CNC machines have RS232 ports & SFA can connect them to your network. With our Wired CNC Connect, Wireless CNC Connect & LAN Connect, you have many options available. Leverage your current IT infrastructure on the shop floor & replace the long RS232 runs of older style hubs. Take advantage of your company’s wireless network & get rid of cables all together! The benefit to using Ethernet is that it allows multiple PCs to be able to access machines on the shop floor. Ethernet can go longer distances, which keeps the RS232 connection short, & that means more reliable DNC communication. Wireless CNC Connect devices stay mounted to the machine – confirm you have a dependable wireless signal, move your CNC machine, & it is always connected to the DNC system. Corporate networks expand beyond front offices & engineering departments on a daily basis. Network backbones are found on 80 percent of manufacturing shop floors. If you are looking for a wired Ethernet Connect solution, we have this option available in 1, 2, 4, 8, and 16 surge protected ports. We also have Wireless Connect solutions, if you are interested in getting rid of wires.